Repetition is a powerful force for change. I’m not referring to the use of interval sets to improve threshold, but rather the regular need to examine and analyse data from the growing number of athletes racing with power. My ad hoc analyses of past races have evolved into an efficient spreadsheet that gives an overview on what matters in Ironman – pacing. A single process that takes power meter data and produces a set of charts chosen to provide insight into what did or didn’t work on the day. Of course there is more to understanding a race than data files – race reports aren’t just for blog content – but for today’s post I am going to outline the basic process I apply to race data. 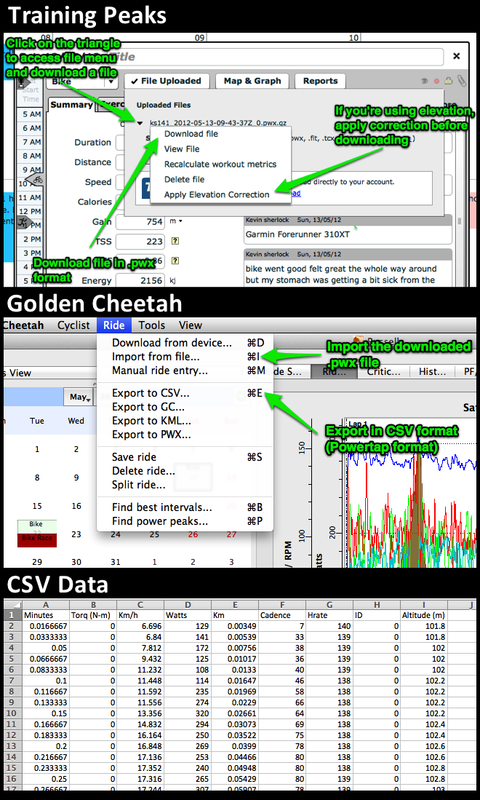 TrainingPeaks, WKO and Golden Cheetah provide tools to examine power files, but useful as they are they don’t have the exact charts I want (and to be honest often their graphs are just ugly – it matters). So before any analysis takes place, the first stage is to get the power data into a format I can manipulate in Excel, the original Powertap CSV format works well. It’s not often power files are delivered directly in that format, so I typically have to use a program like WKO or Golden Cheetah (it’s free) to do the conversion for me. 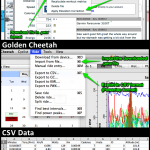 I’ve outlined the conversion process from TrainingPeaks through to Excel in the diagram to the right. 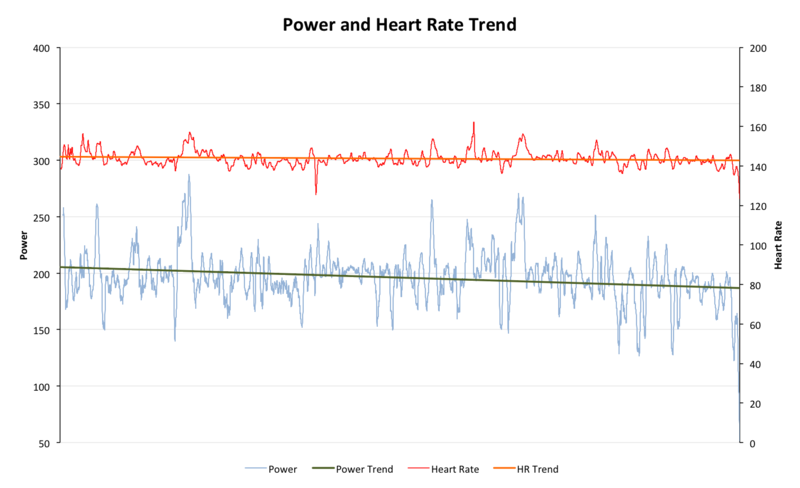 The first analysis I applied to any of my race files was examining the trend in heart rate and power. Declining heart rate or power can be indicative of many common Ironman racing mistakes – starting too hard, insufficient hydration or nutrition, or simply fatigue. The trend itself may not give the reason – remember the importance of a race report – but it can demonstrate where something has gone wrong; there are always those instances of the amazing bike, followed by a meltdown on the run – usually the signs are present in the data. 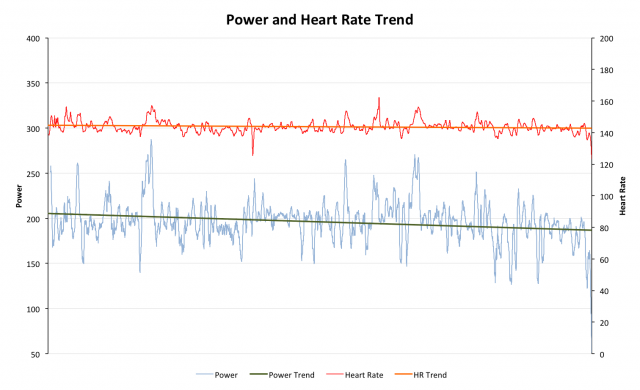 I might also consider decoupling, the degree to which heart rate and power diverge, again it may indicate pacing errors or fatigue, but generally the trends in power and heart rate alone are enough. The chart below shows an example of a reasonably paced race with a relatively small decline in power, the athlete in question was happy with their performance and the run that followed. My athletes race with guidelines built around the idea of capping their power. They have two caps for race day: cap 1 applies for most of the race, while cap 2 comes into play under tougher conditions such as a moderate climb or section of headwind; in addition they are firmly reminded to avoid crossing their threshold (FTP). Once you planning your race around a set of power targets then you inevitably need to examine your race with respect to those targets. Higher power output makes greater demand on energy reserves, costly over the course of an Ironman race, caps provide a simple way to control this and in the analysis time spent above those caps often indicates poor pacing. 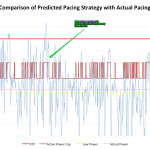 The second chart from my athlete shows the trend in power remains comfortably below cap 1, but we can also see many spikes above threshold; fortunately this was a Half Ironman allowing greater margin of error. 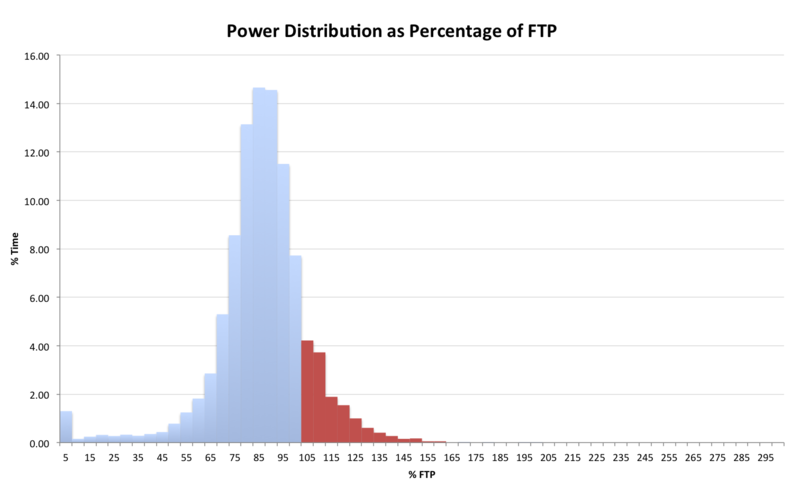 Interested in the impact of time over threshold during an Ironman I added a histogram of the distribution of power throughout the race. Ideally I want power primarily clustered around cap 1 with short tails to either side, but a race that involves numerous spikes above threshold will see a heavier tail at the higher percentages of threshold. Inevitably threshold is crossed during a long race, even for brief moments, the point is to minimise how often this happens, avoiding dipping into the red. The next chart shows that my athlete spent over 10% of his race above threshold, while a Half Ironman allows for higher intensity, this leads me to suspect his FTP estimate is currently inaccurate; analysing the outcome of practice races can allow further adjustments before the goal race. 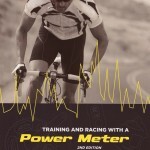 The overall distribution of power doesn’t give an indication of how performance changes over the course of the bike. 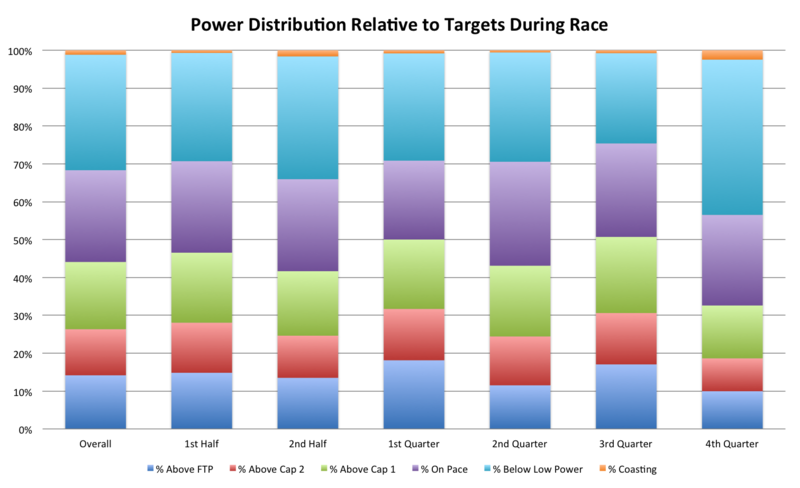 The most recent addition to my spreadsheet attempts to address this by dividing the race into quarters, then looking at how power was distributed during each period. To keep the chart simple I’ve used the zones defined by the race power caps considering the percentage of time spent in each. This is particularly useful for demonstrating pacing errors – excessive time above cap 2 or threshold in the early quarter followed by large periods at low power later on would be very typical of riding out too hard. The final example from my athlete shows the first three quarters of the race were general consistent, variability largely coming from terrain (climbs pushing my athlete towards cap 2 and FTP), but in the final quarter the pace drops off. We need to look at what happened in that final stage as there may be something we can address in training or planning before the next event. Properly analysing a race involves much more than producing a few simple charts, they’re visual aids to enhance understanding, interpreting them in view of a race report and then, most importantly, applying that information to future training and racing is where the real work happens. The process continues to evolve, and now I am looking at incorporating course profiles into the analysis as this can clearly have a significant impact on how a race is managed. This level of analysis may seem obsessive, data isn’t for every athlete, but it can provide worthwhile feedback and has enhanced a number of my athletes’ preparations. 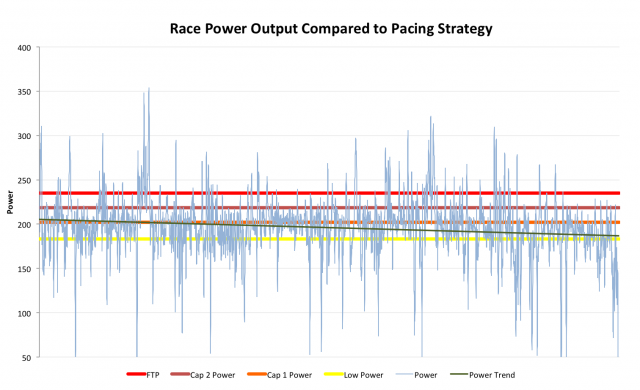 Confined to one blog post this is a rushed overview of one aspect of race analysis. The best way to understand the process is to use real life examples, so in the next few weeks I’ll be taking a few athletes’ data and picking over their races considering what we learnt in the process and how we applied that moving forward.